Sri Lanka is stepping up its game in trade by going full steam ahead on negotiating free trade agreements (FTAs) with three of its major trading partners – India, China and Singapore. The -government hopes to conclude discussions and strike comprehensive trade deals with India and Singapore by December 2016, and with China by the first quarter of 2017. Sri Lanka’s recent enthusiasm for FTAs with major trading partners, dubbed in the media as “FTA Mania”, is not without good reason. Deeper trade integration and investment cooperation, access to markets/cheaper inputs and enhanced competitiveness etc., are among some of the potential benefits that FTAs offer partner countries. However, when tariffs are brought down through FTA negotiations, non-tariff measures (NTMs) can reduce the utilization of FTAs if they are not effectively dealt with. As experienced under the Indo-Lanka Free Trade Agreement (ILFTA), many Sri Lankan exporters have faced a multitude of difficulties in entering the Indian market due to the prevalence of NTMs – such as state taxes, standards, and administrative procedures, quotas, etc. – which were outside the scope of the Agreement. Hence, NTMs should be identified at the onset in the trade negotiations and addressed along with tariff reductions/eliminations for FTAs to deliver the desired benefits. 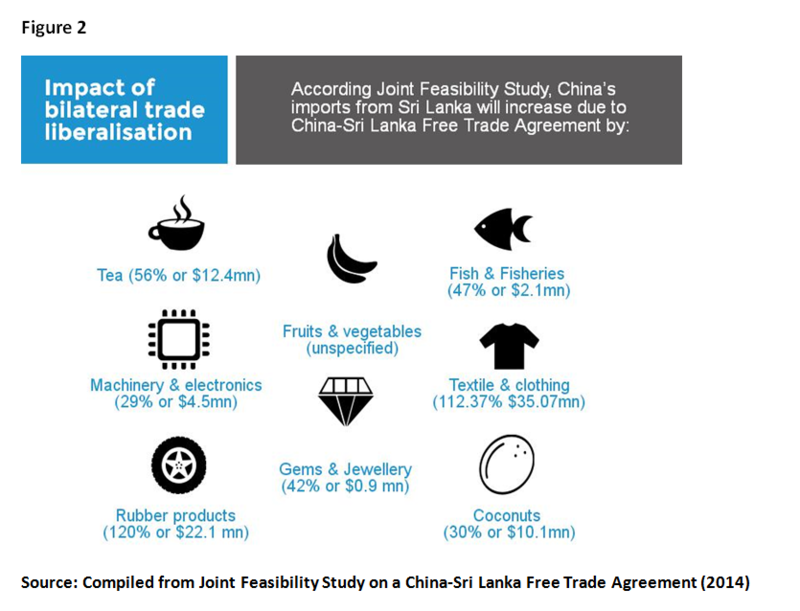 A joint feasibility study on the China-Sri Lanka FTA identified that the proposed FTA would facilitate an increase of bilateral trade, particularly in certain product sectors of interest to Sri Lanka including, but not limited to, tea, rubber products, fish and fisheries products, textile and clothing, coconut products, gems and jewellery, fruits and vegetables, machinery and electronics. The study highlights that trade liberalization will increase in China’s imports from Sri Lanka between 29% (machinery and electronic product)and 120% (rubber), depending on the export product in question (Figure 2). An independent study by IPS identified a total of 541 products in which Sri Lanka has a comparative advantage vis-à-vis the world, including China. Of the 541 potential exports to China, Sri Lanka already exports 244 products. The remaining 297 products with trade potential to China are currently not exported by Sri Lanka to China but are imported by China from elsewhere in the world, presenting new market opportunities for Sri Lankan exporters. However, the ability of the proposed FTA to be a game changer for Sri Lanka’s trade front depends on the country’s capacity to simultaneously address both tariff and NTMs amongst other issues to capitalize on the untapped trade potential in China. Agricultural exports covered in the study (tea, fish and fisheries and fruits and vegetables) are mostly burdened by NTMs, compared to tariffs. With regard to NTMs, the commonly cited problems faced by agricultural exporters to China revolves around high sanitary and phytosanitary (SPS) requirements compared to other export markets, and the lack of mutual recognition of standards and certificates. For example, tea exports to China are subject to rare-earth content testing, which is unique to China and not a requirement in other markets. Moreover, the exact particulars of this standard are not clear. It is also revealed that testing for rare-earth content is problematic as the available testing facilities in Sri Lanka are insufficient – the current facilities can only specify if rare-earth content is present or not in tea, but the levels of rare-earth cannot be determined as per se Chinese requirements. Moreover, China does not recognize testing and certificates provided by Sri Lanka, while testing in China is considered to be time-consuming and complex. Issues relating to quarantine and testing/certification are reported across other agricultural export categories as major impediments, as well as lack of transparency with regard to the food safety regulations. The frequency of test reports and the levels/limits required in China are considered to be greater than in any other markets. 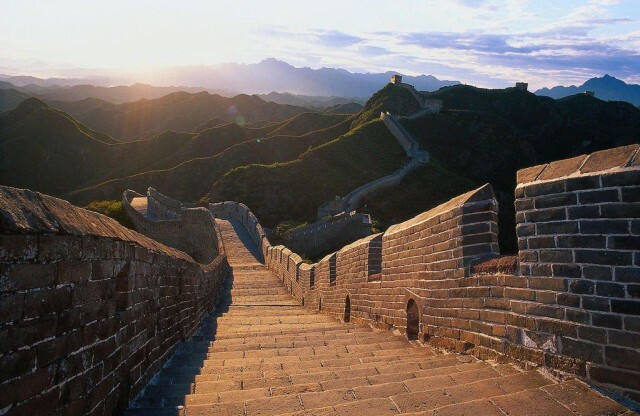 The lack of necessary testing facilities in Sri Lanka to meet testing and certification requirements applicable to China is also highlighted as a major concern. For example,fisheries exporters state that other markets require exporters of shrimp to obtain an antibiotic test report for one pond in a shrimp farm, while for China, antibiotic reports have to be provided for each and every pond in a farm. Meanwhile, obtaining quarantine requirements for fruits and vegetables are stated to be extremely cumbersome and time-consuming, involving a lengthy approval process. For example, it takes Sri Lanka nearly three years to obtain quarantine certification to export bananas to a few ports in China. Sri Lankan exporters face both tariff barriers and non-tariff barriers when entering the Chinese market. 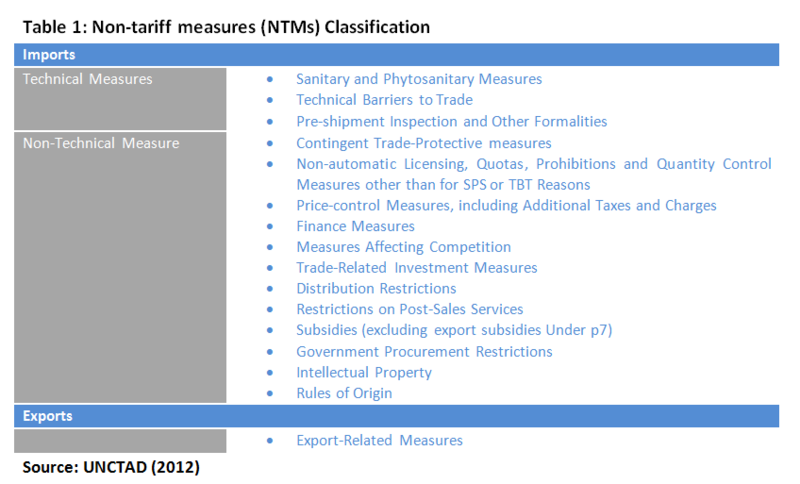 An FTA, which does not address NTMs, may not be sufficient in delivering the expected trade gains for Sri Lanka. Therefore, it is imperative for China-Sri Lanka trade negotiations to simultaneously address both tariff barriers and NTMs. Given that the agreement with China is going to be a comprehensive one, SPS/TBT issues will be taken into account during the negotiations. Some of the key issues to figure in negotiations, include but are not limited to, (a) addressing NTMs in addition to tariff concessions as a priority, (b) setting up Chinese accredited testing laboratories in Sri Lanka whilst (c) enhancing capacities and efficiencies of testing laboratories in the country which China may consider assisting under the umbrella of economic and technical cooperation, (d) striking Mutual Recognition Agreements (MRAs) on standards, (d) translating all trade-related documents/ regulations/ information into English, (e) appointing nodal points in both countries to handle issues at the point of clearance; and (f) establishing better relationships/coordination between relevant respective competent authorities to facilitate trade. 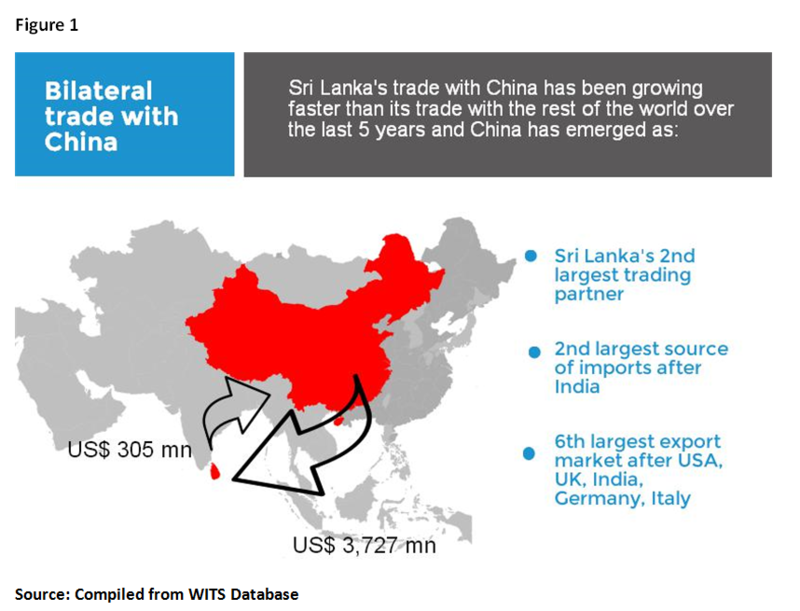 This blog is based on the IPS study ‘Exporter’s Perspective on Accessing Chinese Market under China-Sri Lanka FTA’. Authors, Nipuni Perera is a Research Officer and Janaka Wijayasiri is a Research Fellow at IPS.